So this year I came up with a challenge for the whole year! 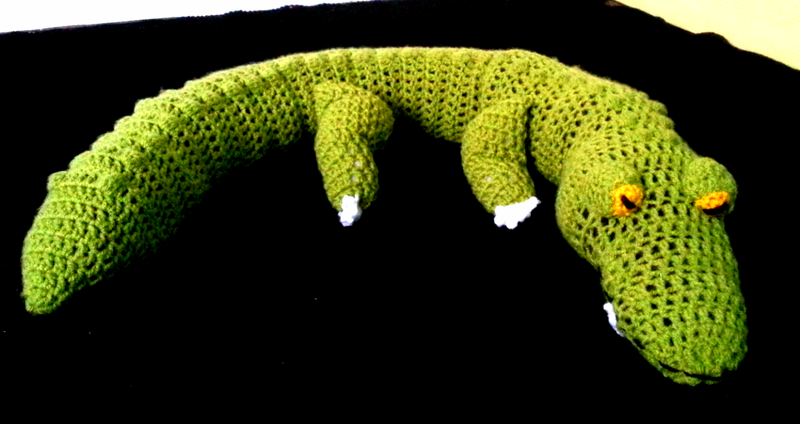 Crochet animals in alphabethical order. And today it's the A from Alligator. Since we live in an old farm there is a lot of draft these days in the winter. Although, it is quite warm for the time of year, I don't know how it is over there? So I came up with a draft strip, and frankly I love the way it turned out! And today I will share my pattern with you! 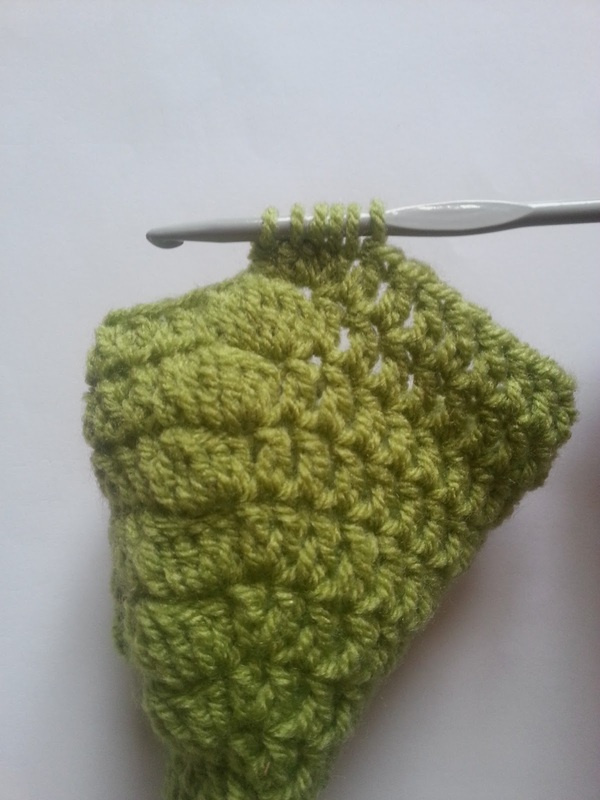 Always start with a double crochet in the same stitch as the chain 2. When increasing always end in the same stitch as chain 2. Never count the chain 2 as first double crochet. 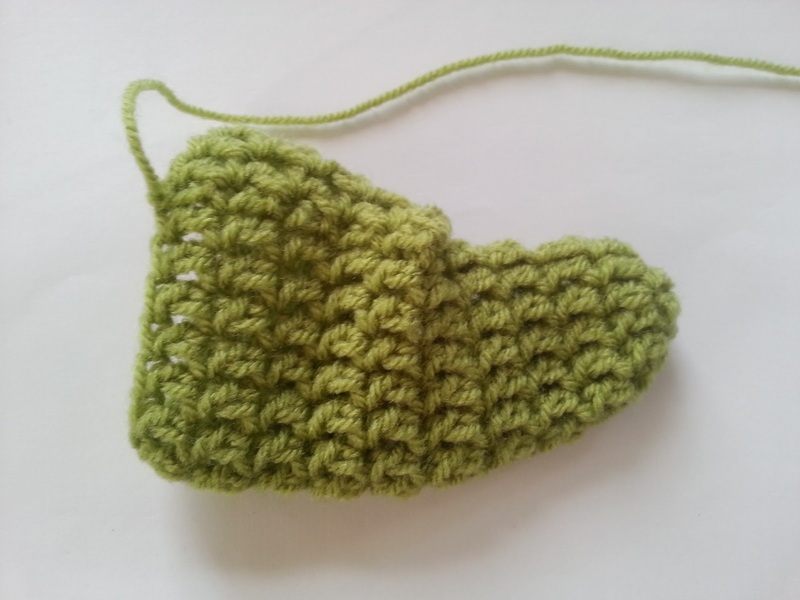 Always slip stitch in the first double crochet, not in the chain 2. Q: How to make a magic ring? A: Click here for the video. 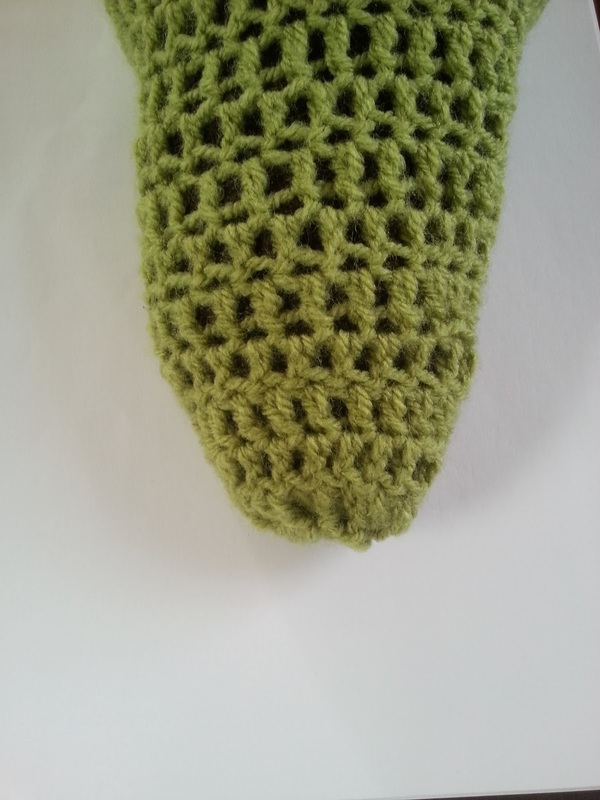 Q: How to make a bobble stitch? 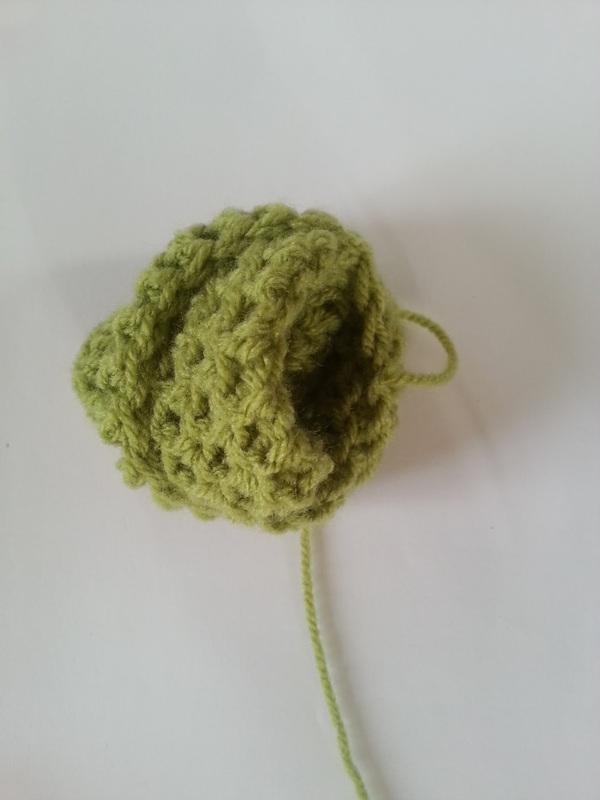 A: We make our bobble with 5 double crochet instead of 4. Work 5 dc in 1 stitch leaving the last loop unworked on the hook. When you have 6 loops on the hook pull through all the 6 loops and there it is, a bobble. A: Yarn over, put the hook through the stitch, yarn over, pull (now you have 2 loops on your hook), yarn over, hook through next stitch, yarn over, pull, yarn over and pull through the 3 loops left on the hook. 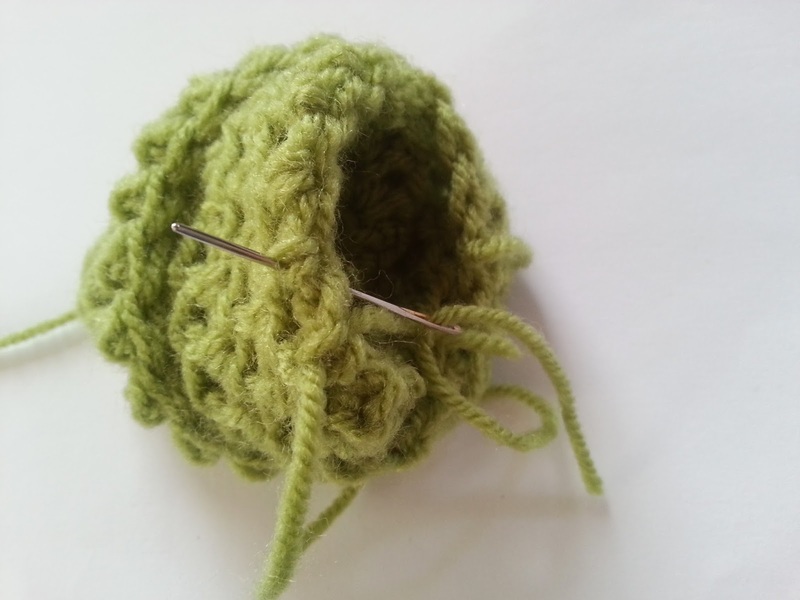 We work the body in rows, because the bobble stitch turns up on the wrong side. Row 1: 6 dc in magic ring, the first 2 ch don't count as first dc, turn. Row 2: ch 2, *1 dc in first, 2 dc in the next* repeat to end (9st), turn. Row 3: ch 2,*2 dc in first 2 st, 2 dc in the next* repeat to end (12st), turn. Row 4: ch 2, *3 dc in first 3 st, 2 dc in the next* repeat to end (15 st), turn. Row 5: ch 2, *4 dc in first 4 st, 2 dc in the next* repeat to end (18 st), turn. Row 6: ch 2, *5 dc in first 5 st, 2 dc in the next* repeat to end (21 st), turn. Row 7: ch 2, *6 dc in first 6 st, 2 dc in the next* repeat to end (24 st), turn. Row 8: ch 2, *7 dc in first 7 st, 2 dc in the next* repeat to end (27 st), turn. Row 9: ch 2, *8 dc in first 8 st, 2 dc in the next* repeat to end (30 st), turn. Row 10: ch 2, 9 dc, bobble, 5 dc, bobble, 14 dc (30 st), turn. Row 11: ch 2, dc across (30 st), turn. Row 12 - 58: repeat row 10 + 11. Row 59: ch 2, 9 dc, bobble, 2 dc, 2dctog, 1 dc, bobble, 7 dc, 2dctog , 5 dc (28 st), turn. Row 60: ch 2, dc across (28 st), turn. Row 61: ch 2, 9 dc, bobble, 1 dc, 2dctog, 1 dc, bobble, 6 dc, 2dctog, 5 dc (26 st), turn. Row 62: ch 2, dc across (26 st) , turn. Row 63: ch 2, 9 dc, bobble, 1 dc, 2dctog, bobble, 5 dc, 2dctog, 5 dc (24 st), turn. Row 64: ch 2, 6 dc, *2 dc in 1 st* repeat in total of 3 times, 11 dc, *2 dc in 1 st* repeat in total of 3 times, 2 dc (31 st), turn. Row 65: ch 2, 2 dc, *2 dc in 1 st* repeat in total of 6 times, 4 dc, bobble, 2dctog, bobble, 4 dc, *2 dc in 1 st* repeat in total of 6 times, 5 dc (42 st), turn. Row 66: ch 2, dc across (42 st), turn. Row 67: ch 2, dc across (42 st), turn. 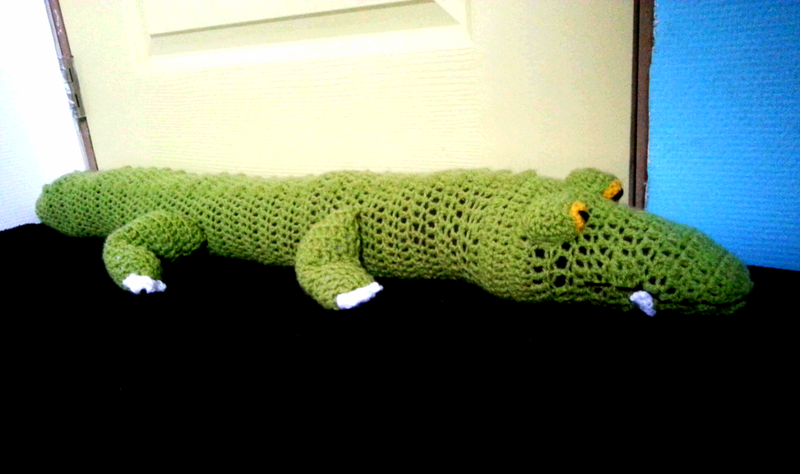 Now is the time for stuffing the alligator. So take your old tights and stuff it with your old socks, t-shirts and other old fabric you wanten to throw away (this is recycling people!) and slide (and push) it in to the body. Now go further and stuff it after every row a little bit. Row 68: ch 2, 7 dc, *dc2tog* repeat 6 times, 11 dc, *dc2tog* repeat 6 times (30 st), turn. Row 69: ch 2, 1 dc, *dc2tog* repeat 3 times, 11 dc, *dc2tog* repeat 3 times, 6 dc (24 st), turn. Row 70: ch 2, dc across (24 st), turn. Row 71: ch 2, 5 dc, 2dctog, 10 dc, 2dctog, 5 dc (22 st), turn. Row 72: ch 2, dc across (22 st), turn. Row 73: ch 2, 4 dc, 2dctog, 9 dc, 2dctog, 5 dc (20 st), turn. Row 74: ch 2, 4 dc, 2dctog, 8 dc, 2dctog, 4 dc (18 st), bind off but leave a long tail. Now weave a round through the stitches and pull so it finish up in a round. I made one because other wise it doesn't fit against the door. For a toy better make two. Round 1: 6 dc in magic ring. Round 4 - 11: ch 2, 1 dc around, 1 dc in same st as ch 2 (this way we increase every round), in the last round bind off. Turn your leg on the inside out and sew the 5th and 6th round together with 6 stitched. Stuff the leg lightly and sew on the body. Round 4 - 14: ch 2, 1 dc around, 1 dc in same st as ch 2 (this way we increase every round), in the last round bind off. Turn your leg on the inside out and sew the 5th and 6th round together with 6 stitches. Now stuff the leg half, and sew on the opposite side the 11th and 12th round together with 6 stitches. Fill the leg lightly and sew on the body. Ch 8, 1 slst in 4th ch from hook, 1 sc, *ch 3, 1 slst in 3th ch from hook, 1 sc* repeat in total of 3 times. Row 1: 6 sc in magic ring, ch 1, turn. Row 2: 2 sc in each st (12 st), ch 1, turn. Row 3: 1 sc in each st, ch 1, turn. Row 4: 1 sc in each st, ch 1, sc along the side with 6 sc, slst in first sc, bind off. Round 1: 6 sc crochet in magic ring. Round 2: 2 sc in each st (12 st), bind off. 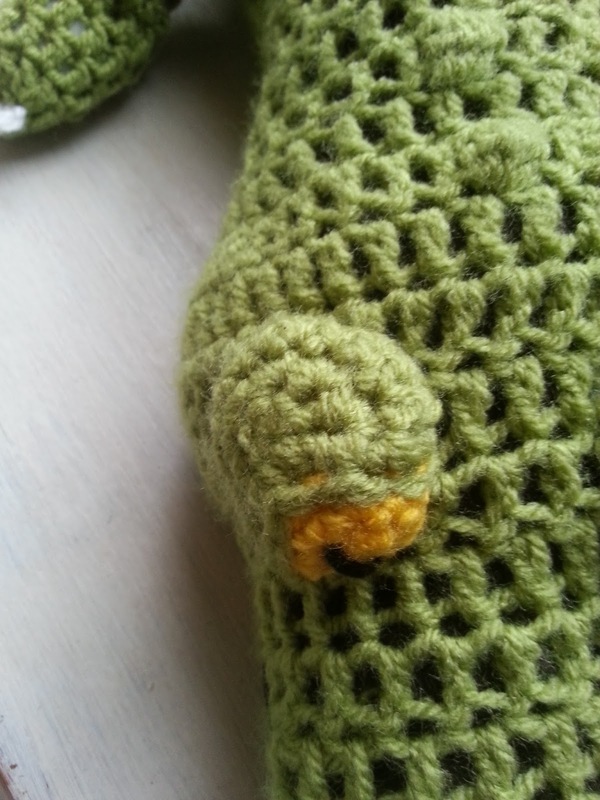 Sew the yellow piece on to the green piece along the straight side. So it becomes a up standing eye. Sew a black stripe in the middle of the eye. Ch 5, slst in 2nd ch from hook, sc, hdc, bind off. 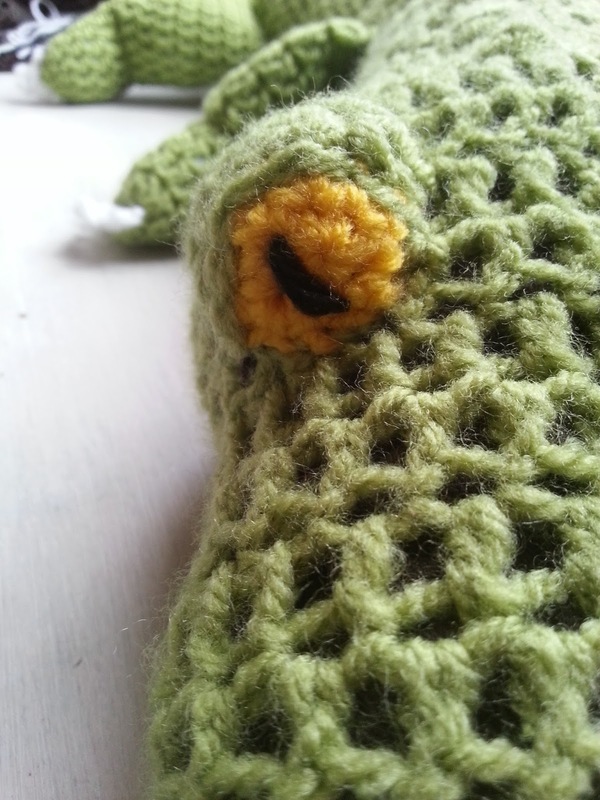 First embroider a beak onto the alligator and then sew the tooth pointing up. 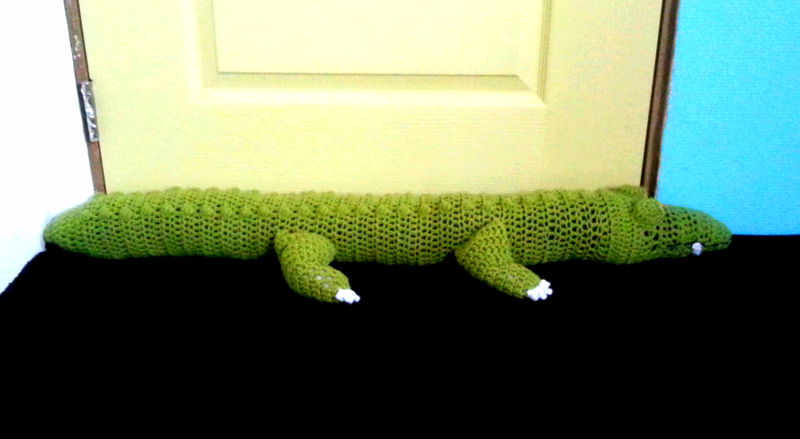 And tadaaaa a Alligator draft strip! When you have made a draft strip or toy with this pattern please put a link to this blog when you publish it on social media. 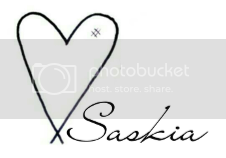 Please do not publish this pattern as your own, I have put a lot of work in writing and translating it.